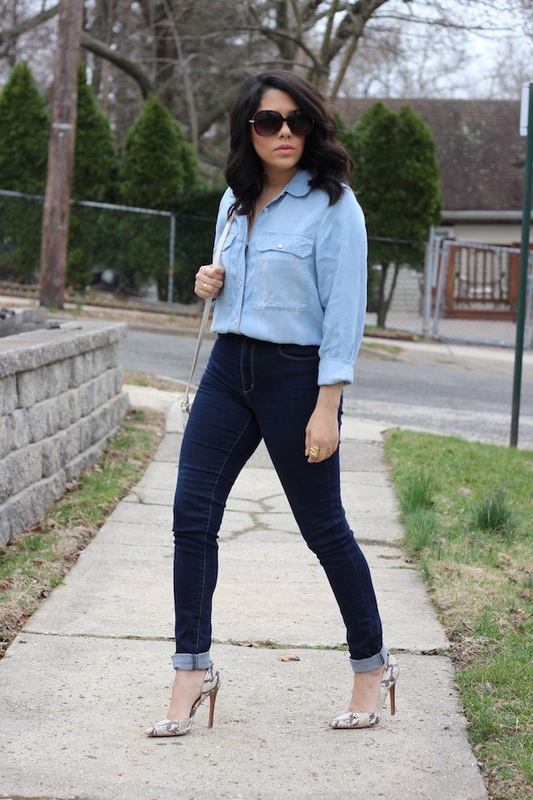 Denim on denim [aka the Canadian tuxedo] has been around for awhile. It can seem a bit intimidating to wear at first. I think back to Britney & Justin in their all denim outfits on the red carpet years back. Eeek! For me, a rule of thumb with this trend is to pair dark denin with light denim. I even prefer to keep the dark on bottom and light on top. At least in the beginning when you are first trying this out, I think that’s a good way to do it. This boyfriend chambray top is super soft and oversized. It was a little tricky for me to tuck it into my jeans since it’s so long, but I kind of like the loose fitted look. I actually got this top over 2 years ago and never really wore it until recently. When it came to the shoes, I was thinking of what I had that would work. I swear these snakeskin print pumps have been my go-to shoe for so many outfits. It’s such a great neutral print and I love the way it looks with the double denim. How do you feel about this trend? Have you tried it out yet? I would love to know your favorite ways to wear it! Your shoes are so fun! Love what they add to this look! I'm all about denim on denim. It's a classic look that's not going no where; I love the simplicity it brings to the table. Great choice of shoes! Bella.